Indulge in a sweet, satisfying dessert without a moment of regret. These jel desserts and puddings from Simply Delish are a delicious conclusion to mealtime, and what's more, they contain all natural ingredients. Fun for kids and grown-ups alike, these desserts stand on their own and also can be incorporated into a variety of tempting recipes. 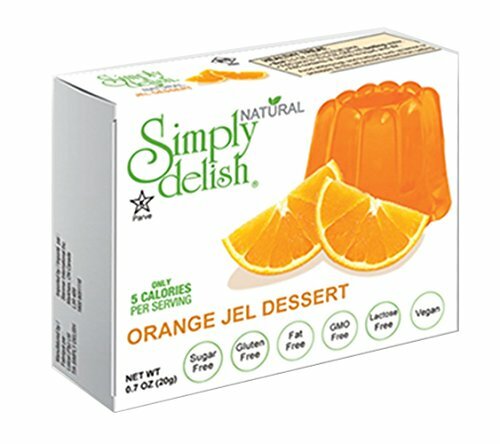 Simply Delish jel dessert is available in orange, peach, raspberry and strawberry, as well as unflavored to create your own treats. Simply Delish pudding and pie filling comes in chocolate, strawberry and vanilla. Not only are these healthy dessert options an enticing reward, they also are an all-natural choice for healthy lifestyles. Simply Delish products are sweetened with a stevia blend, a favorite in many delicious low-fat and low-sugar desserts. They are completely free of animal derivatives and require no refrigeration to set, unlike desserts with a gelatin base. The puddings and jel desserts are gluten free, fat free, sugar free, lactose free and cholesterol free. They contain no preservatives or artificial color. They also are kosher and halal certified, completely vegan and made with non-GMO ingredients. FOUR GREAT FLAVORS - Simply Delish Gel Desserts come in delicious varieties: orange, peach, raspberry and strawberry gel desserts. HEALTHY DESSERT OPTION - Low-fat and low-sugar dessert options are a perfect choice for satisfying a sweet tooth while maintaining a healthy lifestyle. EVERYONE LOVES OUR DESSERTS - As a fun treat for kids or an indulgence for calorie-conscious grown-ups, the desserts are compatible with non-dairy recipes as well as cocktail-inspired gel shots. ALL NATURAL - Orange gel dessert is made entirely with non-GMO ingredients, these all-natural desserts contain no preservatives or artificial colors. JUST WHAT YOU HAVE BEEN LOOKING FOR - Simply Delish desserts are completely gluten free, fat free, sugar free, lactose free and cholesterol free, and are kosher and halal certified. If you have any questions about this product by Simply Delish, contact us by completing and submitting the form below. If you are looking for a specif part number, please include it with your message.